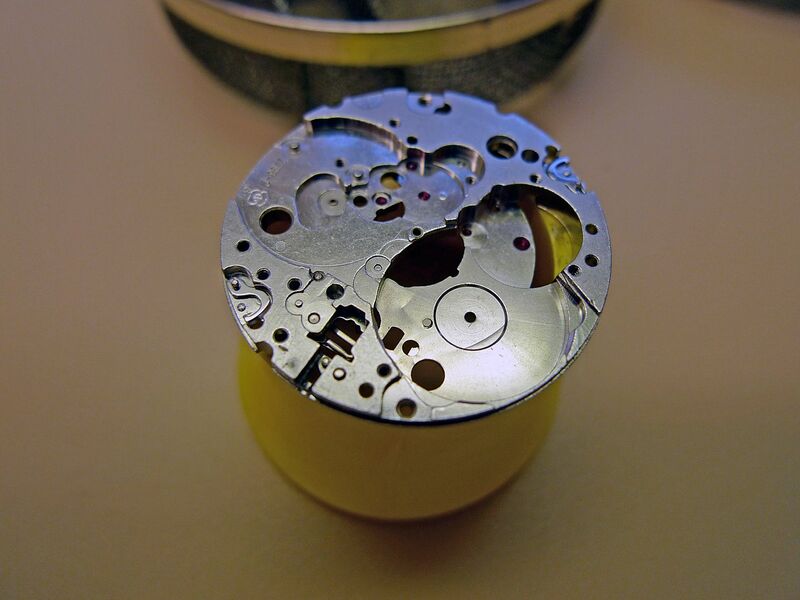 As some of you know since around August I've been trying to broaden my knowledge of watches by delving into their innards and repairing/servicing a few. I've done a couple of self-builds, serviced movements, had a go at refinishing some bracelets and polished a few crystals. I've mainly posted the results over on TZ-UK but I'll redress the balance and post some more of the results here too. 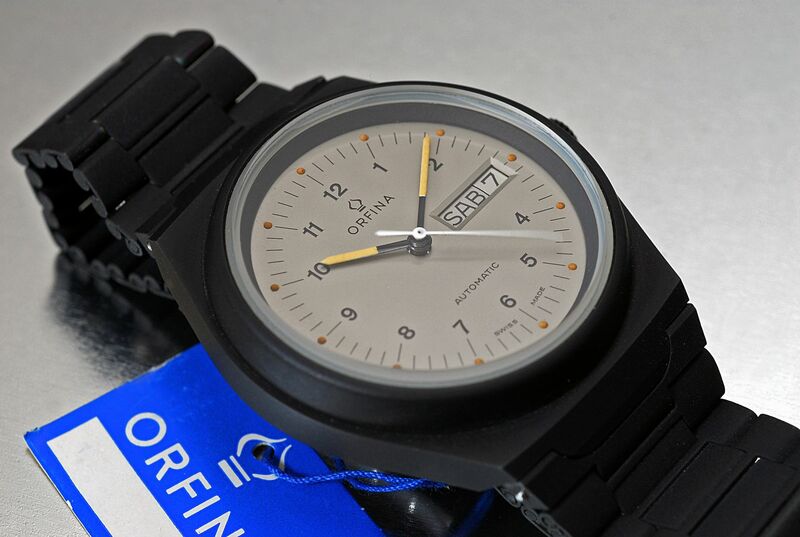 Here's an interesting watch from Orfina which was bought by Dave (sweets) and then sold to Johnny (jchlu) as his wife took a shine to it at a Friday coffee morning session a couple of weeks back. 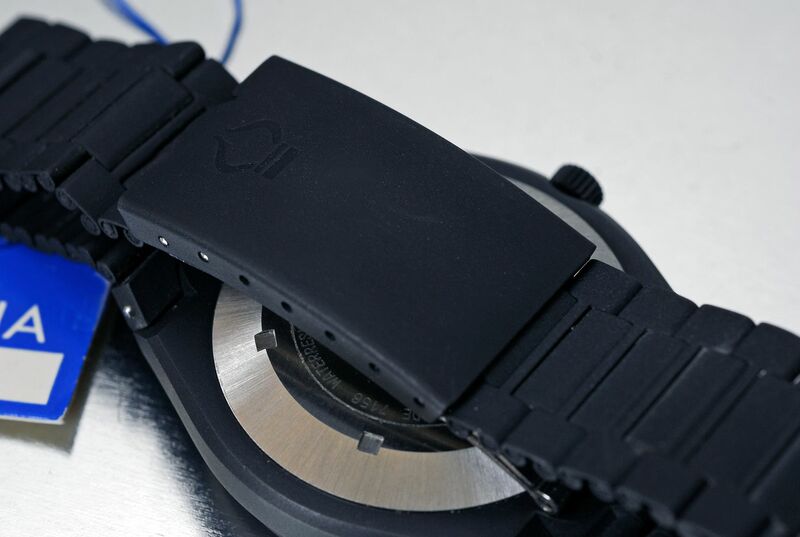 It looks, to all intents and purposes, like a NOS example with minimal marks to the PVD case and bracelet. It even has the blue Orfina hang tag. It certainly felt like a NOS example as it was very stiff to wind or set the time, which is usually a sign that the oils in the movement have coagulated through lack of use. So Johnny very kindly agreed for me to give it a thorough inspection and get back to him with a prognosis. Cracking open the back revealed a movement I haven't worked on, an ETA 2790-1. These were only in production for a relatively short time between 1976 and 1980 so that helps to put a rough age to the watch. 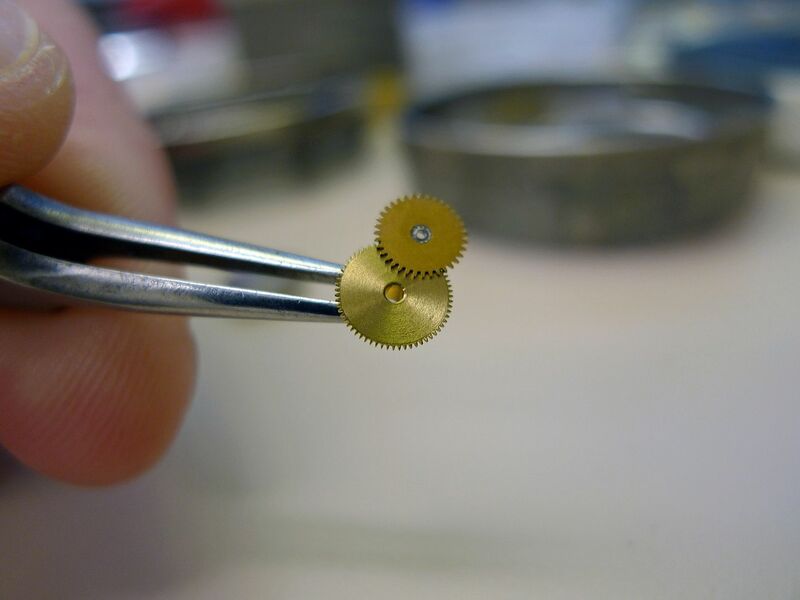 They're a 25 jewel, 28,800 A/h movement with a two language day wheel, in this case French and Italian. An inspection confirmed my suspicions and revealed that this was extremely dry and in desperate need of a good service. In fact this is probably the most extreme example of dryness I've seen, more on that later. Having told Johnny the bad news and agreed a price it was time to take it to the bench and take it apart. 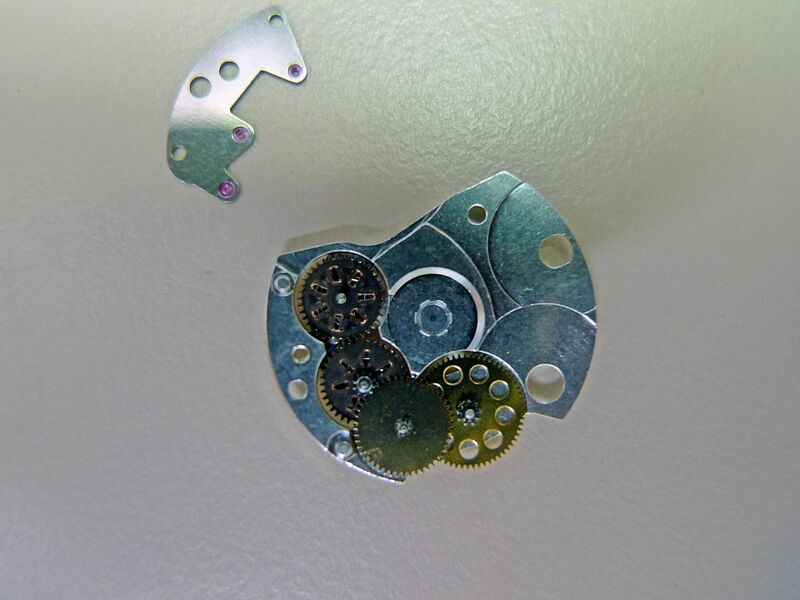 Subtly decorated movement and a lovely contrast between it and the PVD case. There are a few light marks to some of the screw heads and plates, which tells me that this has either been sloppily assembled or someone has cracked the back open at some point. More likely the latter as I'll explain later. Back to the movement and the first thing I notice is the stem is twisted. My first reaction, having never seen one like this, is WTF, have I buggered it up already! 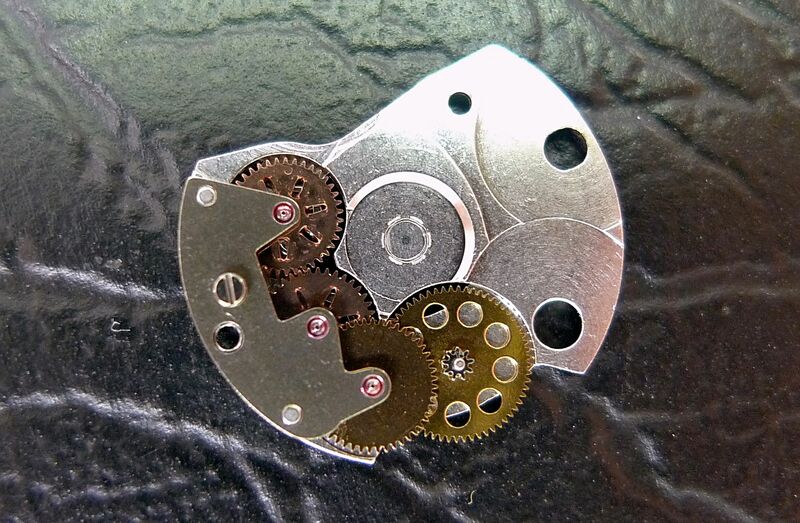 Luckily for me my watchmakers was on hand and reassured me that some ETA movements did indeed have a twist in their stems. Why they did this and what purpose it serves I've no idea. So minor panic over it's time to dissemble the movement. First off removing the balance assembly to reveal the pallet bridge underneath. Then remove the pallet bridge, pallet and train wheel bridge revealing the train wheels. 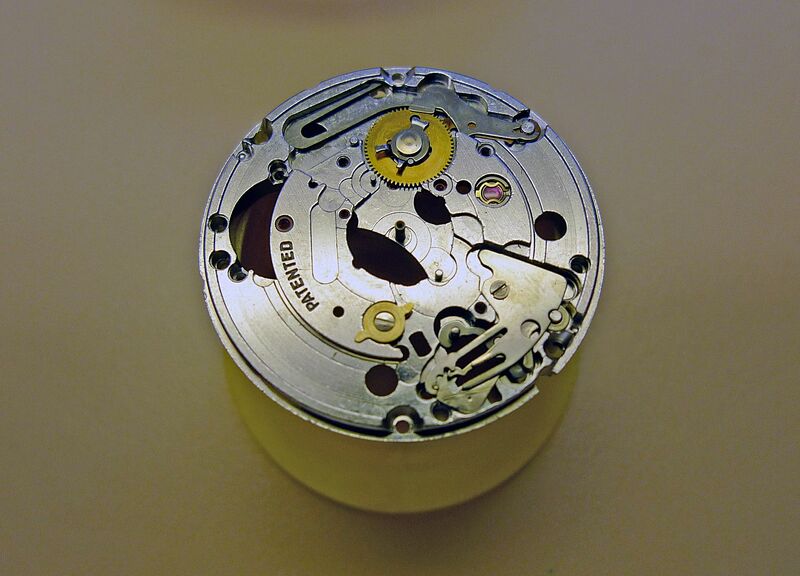 Bottom side of the movement completely stripped and I notice something is not as it should be. There's a dent in the main plate under the mainspring barrel. Not much I can really do about it until I've cleaned all the parts and start reassembly and lubrication. 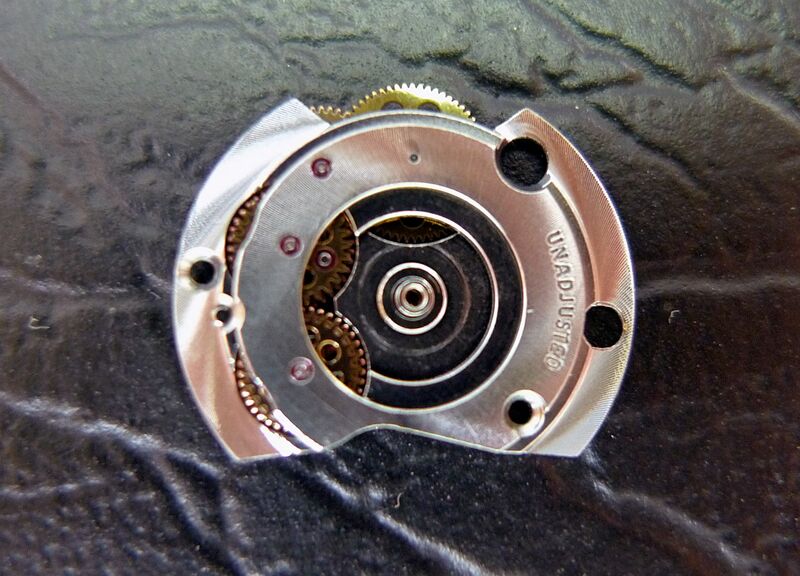 Perhaps this was a customer returned watch and that's why it has a few little marks on the movement. There's no way of knowing for sure. Mental note taken that I must check the end shake on the barrel and it's time for the top half of the movement. Day and date wheel removed. 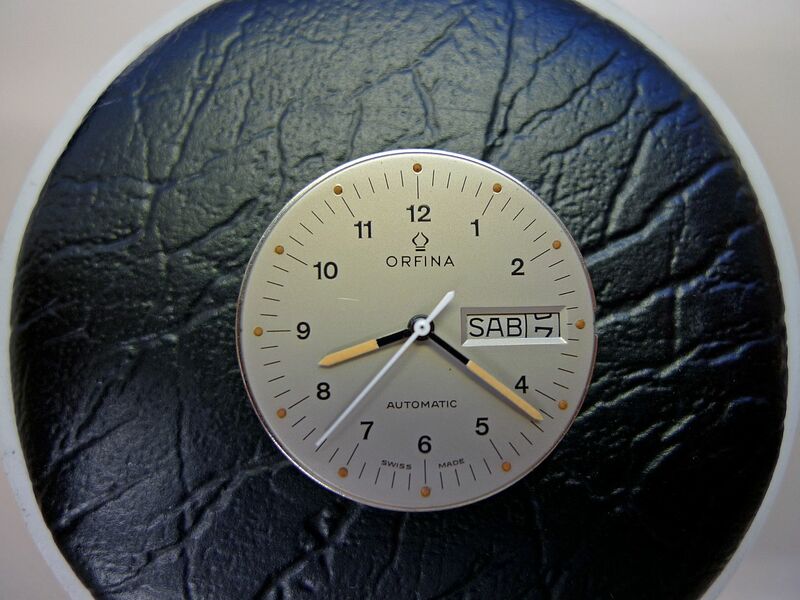 Here's why it was difficult the set the time, the hour and minute wheel are fused together with the old oil. I've never seen an example quite as bad as this and even a fairly sharp knock refused to separate them. 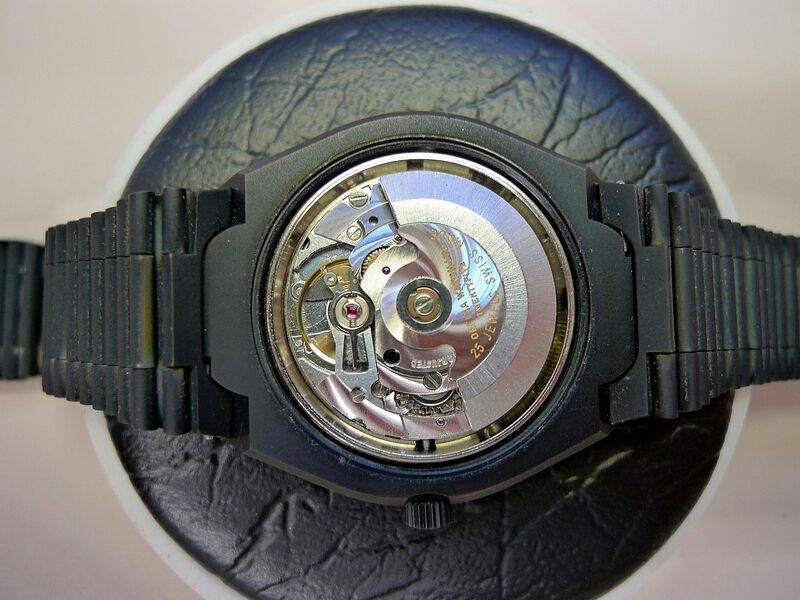 There was a few other parts that were fused together like this too but this makes for a most good example of why NOS watches, in the vast majority of cases, need a thorough service. A few more parts removed. All the parts placed in the cleaning baskets. And into the steampunk cleaner. 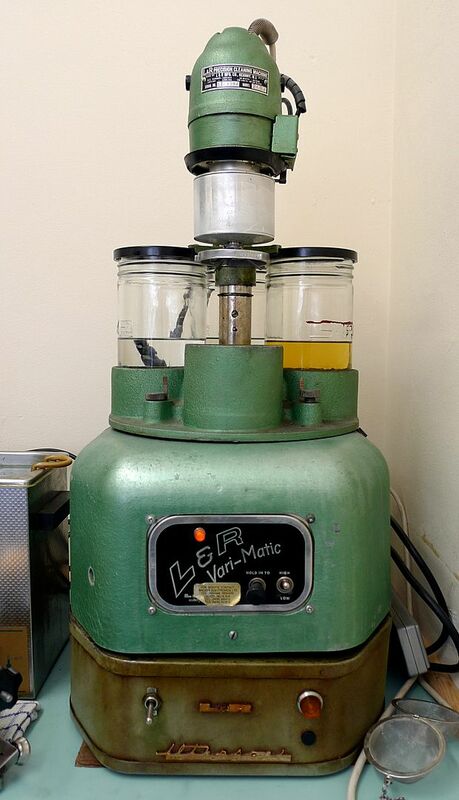 This is a fantastic machine from the 1960's which has a built in ultrasonic cleaner, gives a two stage rinse and then dries all the parts. I won't bore you with the reassembly and lubrication process or the regulation, but I will quickly show you the auto works. 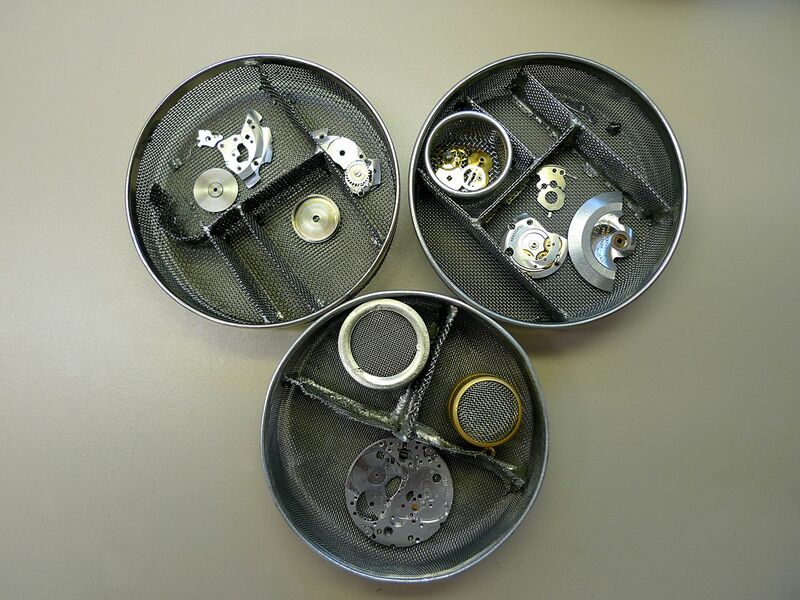 This is the part that sits underneath the rotor and transfers the energy created from it to the mainspring. Underside with the wheels that wind the mainspring. And with the bridge removed. It's a good example of the just how important the oiling process is and is as the four posts that the wheels sit on need to lubricated, as do the three jewels in the bridge. If you don't it will become increasingly ineffective at winding up the mainspring and eventually just cease. 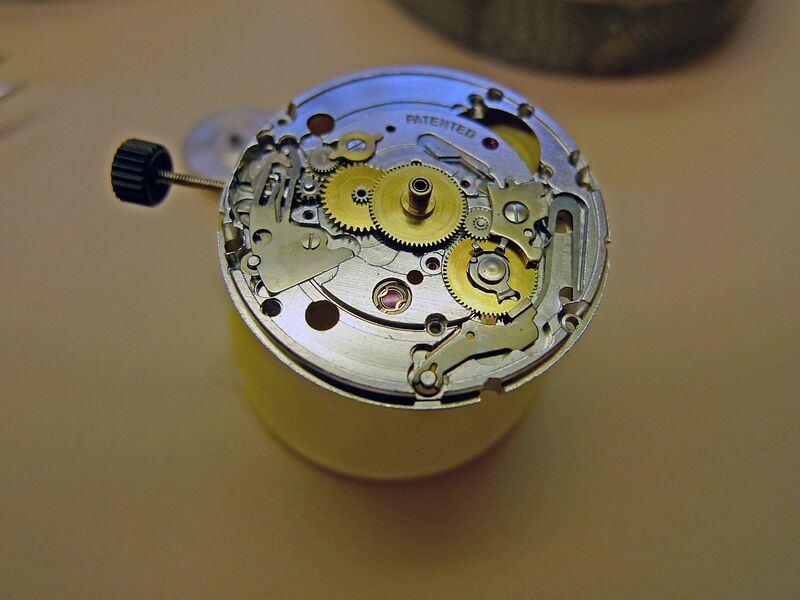 It was interesting to work on another, new to me, ETA movement. A big thank you to Johnny for entrusting this lovely watch with me and many thanks to Rocco for the use of his equipment and sharing his expertise. Hope that was informative and thanks for reading. P.S. The barrel has a touch more end shake (vertical movement) than normal, because of the dent in the main plate, but works just fine. Last edited by agent orange; 14-12-2012 at 23:20. What a wonderful post, Gary. Great to see someone getting into something like this with a passion. Fascinating to see it so nicely photographed too. Great write-up and great insight into the process Gary. 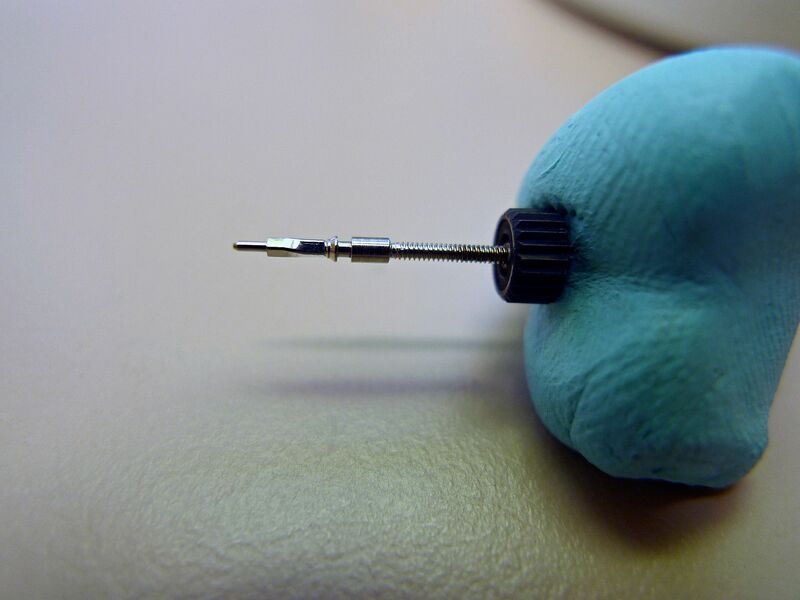 It really is a great little machine, here's a quick close-up I got while I did the bracelet adjustment. Now I've managed to pry my Grandfather's '84 Seiko 5 auto off Z's wrist that will be headed to Gary for a New Year service job and I'm not expecting the condition of that to be as bad as it's at least been running most of its life - not nearly as unusual as this one I'm afraid! 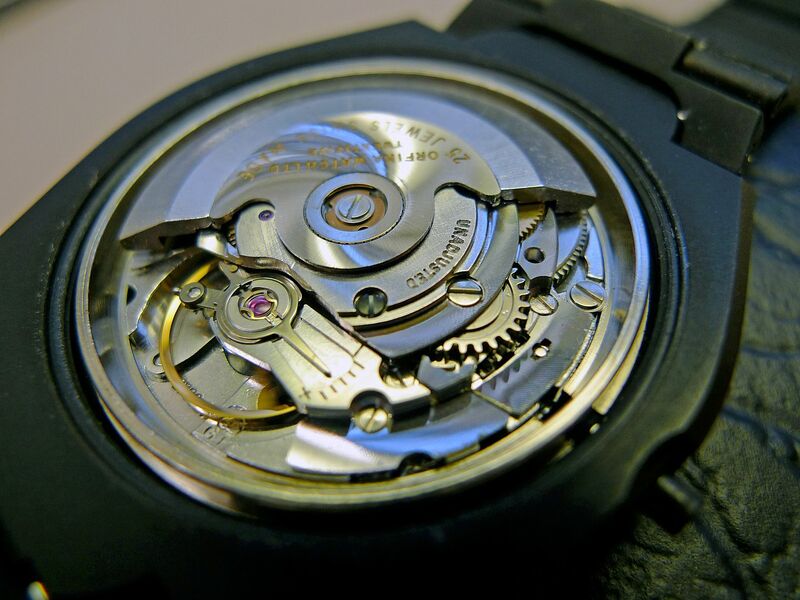 Getting to grips with movements is truly fascinating and brings a whole new level of enjoyment to watches, even those that aren't yours. I've leant more in the last 4 months than the last 10 years (admittedly that's not saying much really ) and my appreciation and admiration for good watchmakers has grown massively. They really are true craftsmen and masters of many different disciplines. Think about it, they have to have a broad grasp of mechanics and engineering, be a metallurgist, understand chemistry, have a fantastic eye for detail and be incredibly dexterous. 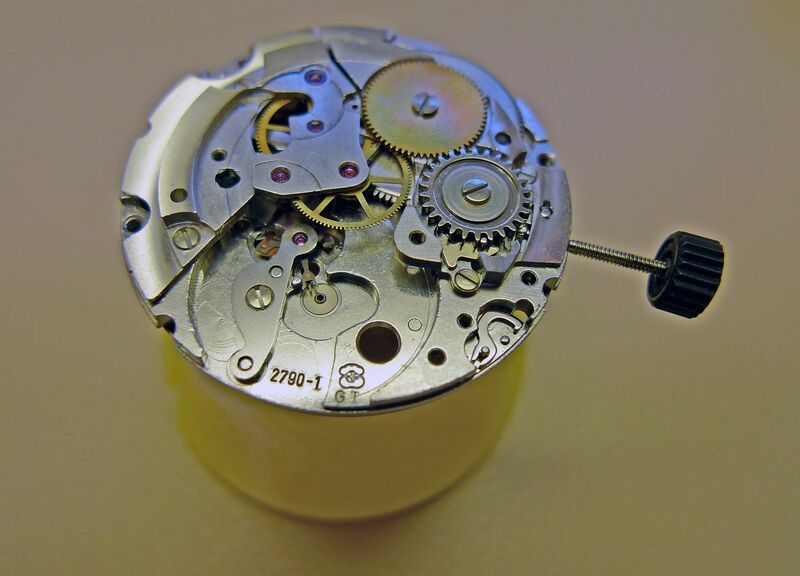 It takes years to become a competent watchmaker and I can fully appreciate why. Taking of good watchmakers I received an explanation for twisted stems from a friend and excellent watchmaker Rich this morning. 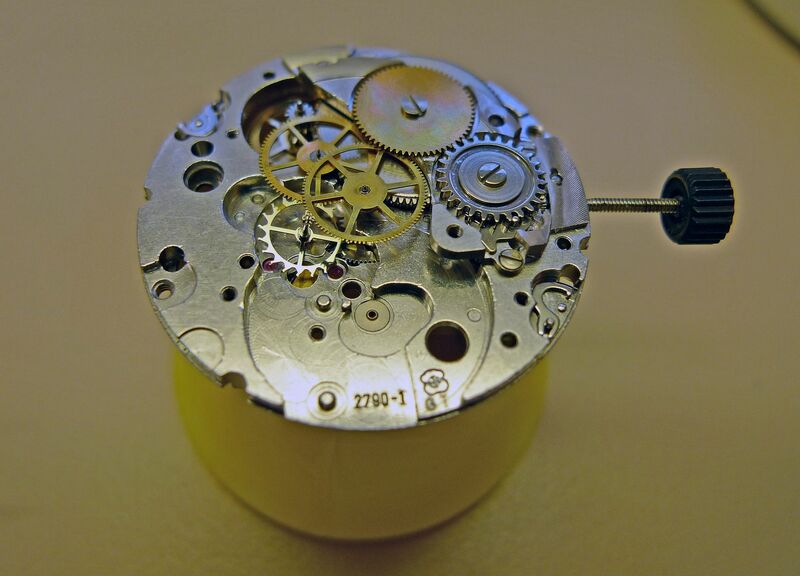 The twist in the stem is there to remove any 'backlash' after setting the time. 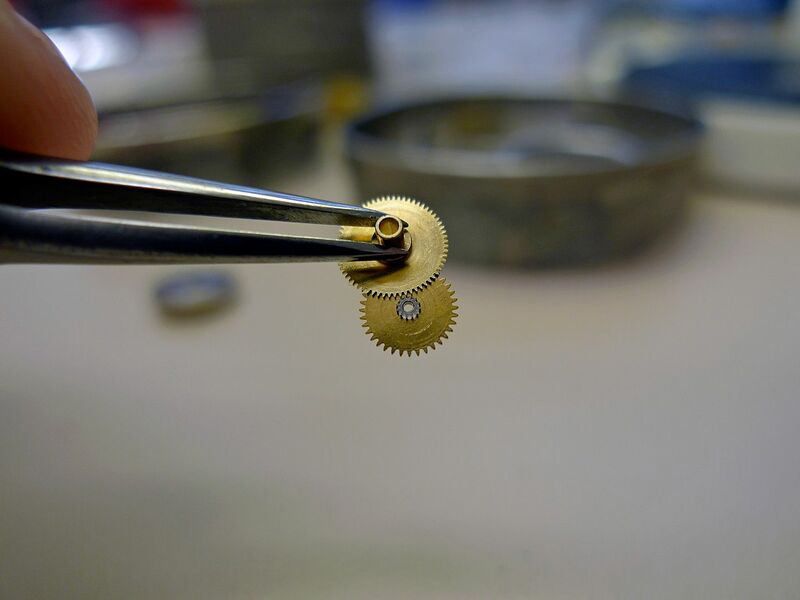 ETA watches don't have a traditional cannon pinion, the dial side components are driven from the third wheel. As there is a necessary amount of play between the third, minute and hour wheels, if you set the time backwards there can be a few seconds lag before the hands catch up with the driving force again. The twist in the stem moves the clutch wheel, intermediate, minute and hour wheels forward so their 'leading edges' are all in contact with the third wheel again. You don't see this on modern ETA movements, and while I'd like to think it's because increased manufacturing tolerances have reduced the amount of backlash present, in truth it's probably a cost saving measure as it's one less operation required when making the stems. These posts are fantastic. I wish I had the time and skill to be able to do something like this but I'll have to make do with reading about other peoples instead. Johnny, if you/your wife ever fancy selling this please give me a shout, the watch looks fantastic!